Home > Maine Lobster Tails! Baked, Stuffed, Steamed, or on the Grill! Our "Tails" Are Blast Frozen Immediately To Ensure That Great Maine Lobster Flavor! way out here in far southwest Arizona . ordered tails this past Christmas for a gift for my wife shes in love with them second year buying from old capn tim , great lobster tails, good prices ,and excellent people to buy from , lookin forward to doin it again this Christmas !!!! I was utterly floored when I coooked the tails, much less ate then . Understand, I only have access to a microwave to do any cooking (Im a disabled vet living in a nursing home)(several strikes against successful cooking)! But, these were the easiest, most tender tails Ive ever cooked. The shell and underbelly was incredibly tender and easy to cut, even using inadequate tools. Cant quite get the proper tools to break down the shells! But these were unbelievable; then the taste was out of this world. I think I ate half of one without melted butter! Im buying another order RIGHT NOW! They (and you!) are awesome! Yum! These are wonderful. Better than most restaurants. Thank you for a quality product. These are great tails. Next time I will try claws. If I can get them. Best Christmas Present we ever received ! We received a gift certificate last year for Christmas and I must say, best present we have ever gotten. We raved so much about the quality and taste of your Lobsters that we were given the same gift this year. Yeah ! I ordered four 10-12oz tails for a Christmas dinner in Florida. The tails came packed frozen in dry ice. They were spectacular. The customer service was accurate and pro-active. I will order from the Lobster Guy again and everyday. The price, quality, and service is unmatched! Came through with 5 claws! 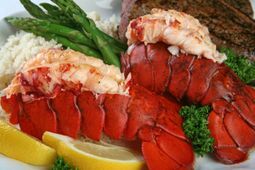 We were have a Christmas party and wanted something a little different so we ordered ten 5 oz lobster tails to go with our filet mignon. They were delicious and fresh and are ordering more for Christmas Eve. We butter poached them on the stove - amazing! Thank you! This will be my 3rd year in a row for your Lobster Tails. Let me just say what happened my 1st year & take it from there... I ordered the pair of 12-14 oz, Lobster Tails. I wasn't thinking straight, because all I could base it on were out dated store tails or local restaurants "6 oz," sizes. I bought a 24 oz. Porterhouse for the Primary Choice. Then I opened the box from Captain Tim and ALL HELL BROKE LOOSE. I could wear just one tail on my head as a hat ! Needless to say... there was enough leftovers for my dog and 2 katz to Party with. KEEP UP THE GOOD WORK CAPTAIN TIM & ASSOCIATES. Needless to say... "I'll Be BACK". Thank you Tim. The lobster tails were awesome. Sorry that FedEx left them at the wrong address. But, we retrieved them in time and they were shipped so well that they were still frozen after 8 hours at the wrong address. I am writing from Sarasota, Florida, and judging from the Weather Channel, no lobster fishing today! My wife and I and our two grandchildren, age 15 & 14 celebrated Valentine's Day last night with 4 beautiful tails from The Lobster Guy. For the past several years, I had been ordering from tocatchapieceofmaine, but have learned they are no longer doing retail. My internet search came up with your website, and many positive reviews. 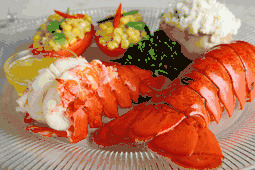 I was tremendously impressed with your customer service as well as the outstanding quality of the lobsters. I look forward to continued business and wish you and your crew well, especially through your nonsense winter. p.s. loved the neat Valentines Day card in the sand!! Perfect! So excited we almost couldn't wait!!! &#1043483; Amazing lobsters! Amazing calamari! You truly are THE lobster guy! on Christmas Eve in 20 years. I have had the pleasure of ordering from you three times now, my parent\'s 50th Anniversary, Memorial Day weekend, and Labor Day weekend. Each and every tail was perfect!! I am a forever customer and I sing your praises loud and clear! Thanks for making me look good! I served the 8-10oz tails at my annual barbeque this past weekend, and my 22 guests LOVED them!!! They were the best tails most of my guests ever had. I had a couple extra tails, and there was almost a fight over who would get the extras! Sweet, tender, and succulent almost doesn't do them justice. Packaging was excellent, and quality was superb. I will definitely be back for more. Don't even consider buying your lobster tails anywhere else but here!! Just a quick note to let you know that fedex came thru and delivered my lobster tails right on time! We cooked those last evening, and I must say, those were the absolute best lobster tails any of the four of us has ever had. My sister and I trimmed them up, cut the undersides, and poached them in butter and garlic (beurre monte of sorts) until just done. Tender and flavorful, those tails were better than even the best seafood restaurants we've eaten in (lots), I will definitely be ordering more! Thank you for your excellent service, and for providing product as good as advertised. Best Lobster Tails I ever Had! We will order more soon! Best prices by FAR! I was really impressed with the lobstertails. They arrived perfect, packed well, and tasted even better! What a class act company to deal with!